Expedition Compass Pendant. Unisex, stunning & waterproof. Working silver compass pendant that’s waterproof, too. The finely detailed design with a chunky tapered band of silver makes this a great compass pendant gift for a man or woman, so could be a christmas gift for a practical man. 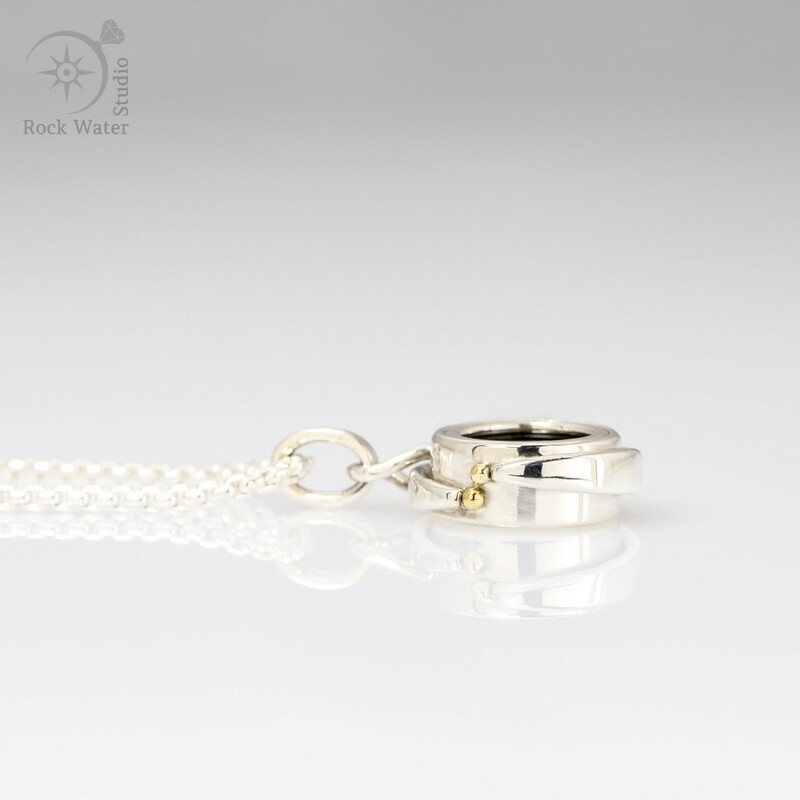 The solid silver circlet tapers to droplets in gold making it an attractive compass necklace gift for your wife to help her find her way. The design is appealing, but the compass is a real working compass, too, so you can always check your direction. Some of us have a poor sense of direction and having a bit of help is appreciated! The compass inside the Expedition Compass IV is a top quality working compass, a Francis Barker survival compass. Uniquely customised to make it waterproof, this is one you never have to take off so you will always have it with you. A beautiful and wearable silver compass treasure to be your talisman, to keep you safe. If you’re looking for an unusual gift for a sailor or someone who enjoys snorkelling then the Expedition Compass IV makes an ideal choice because the waterproof compass inside completely OK to be underwater. A versatile compass pendant to give so anyone looking to navigate life. The gold and silver design elements intertwine and settle together PLUS since it’s been individually handmade, you can be certain that it’s a unique compass pendant. People choose my compasses for a variety of reasons such as a Christening Compass Gift at the beginning of a baby’s life, as a symbol of hope that they will travel safely through life’s journey. 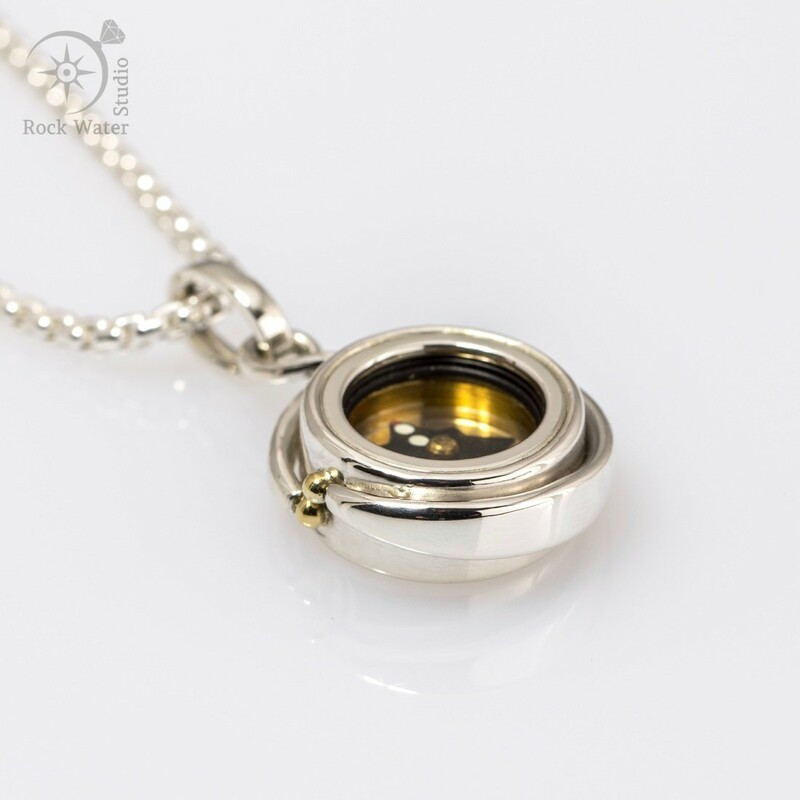 In the same vein, graduation time is significant with a lot of change and new directions, so a Graduation Compass Pendant Gift is a perfect way to express your love and hope for them. As a Silver Wedding Anniversary gift for your wife a compass necklace makes a statement and is often a lovely surprise! If your girlfriend has just moved across the world to be with you, how about giving her a meaningful Christmas compass gift? Or a compass pendant to bring someone back safely. This list of why people choose a compass as a gift is never ending, but don’t forget that you can choose one for yourself, too, We’re all setting out on our own adventures one way or another and a compass pendant talisman is often chosen as a faithful companion and reminder to us to stay true to ourselves. Handmade compass necklace that’s beautiful, practical, reliable and unique. Silver compass with 18k gold.